Lately we have been seeing a lot of excitement circulating on various blogs about HTML5 and it’s support in latest versions of all major browsers. We are constantly improving our IDE to support new standards. Now you can easily enjoy HTML5 development with our new IDEs PhpStorm & WebStorm. Let’s start with a simple example: Create a new HTML document. Say, we’d like to use new <canvas> element. Just press Ctrl+Space and the IDE will suggest all possible variants of autocompleting. Using PhpStorm/WebStorm already? Follow @webide on Twitter. We’re looking forward to your feedback, as always. Why do I have to press ctrl+space every time I want auto completion? Is there a setting that allows the auto completion box to appear automatically upon first key press? This currently works for html, but not for css, js or php. What about for code that is in an include file. As it will have no , how will know to use html5 elements? What about for code that is in an include file. 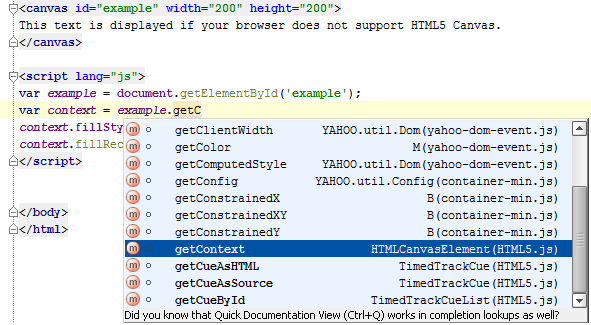 As it will have no !DOCTYPE html, how will know to use html5 elements? Has this feature been dropped from 1.0.1? It no longer works for me. Is this supported in PHPStorm 1.01? I try but it seem not be supported. It’s a bug in 1.0.1. We are going to fix it. We fixed http://youtrack.jetbrains.net/issue/WI-2551 , to appear in WebStorm / PhpStorm 1.0.2, as workaround, please use installation path without spaces inside. Hey, just downloaded the trial. 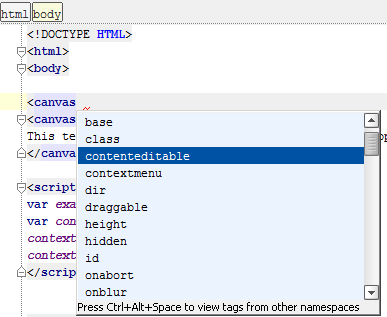 Awesome so far, however, i am having the html5 autocomplete issue / tag coming up as an unknown tag. I’m on osx, and the .app is in my applications folder. Any ideas how to get the workaround to work since I do believe there are no spaces in my installation path? ah! sweet. Renaming the .app from Webstorm 1.0.1.app to Webstorm.app did the trick. Awesome guys. Thanks, I’m an eclipse user that would prefer a pre-refined IDE. I am really starting to enjoy this. I especially like that most of the controls are in line with Eclipse. I had to change CTRL+Y to CTRL+D. Anyway, great tip, simple solution. I’m on my way again. One more thing. Before my free trial expires, I’m wondering about PHPStorm. Do you have an IDE that works with more scripting languages (e.g. dotJS, JSP, Python, Perl, PHP, ASP, Ruby) I’d like to find a solution that I can learn once. For JSP, Python, PHP, Ruby you should use IntelliJ IDEA. But by the way all our IDE’s use it as a platform. So the interface is the same for all products with little difference. Wait a sec…IntelliJ supports PHP? Is PHPStorm just a “flavor” of IntelliJ? If I purchase IntelliJ, do I get all the features of PHPStorm? IntelliJ supports PHP but needs our plugin installed for that. The same for Ruby and Python. All plugins are free. If you are multilingual and often switch between PL’s – then use IntelliJ IDEA. Is there a specific reason why (HTML5) is not supported? PhpStorm says “wrong attribute value”.